When we say we’re going to tell you everything you need to know about how to pay for a college education, we mean it: we’re going lay out, in step-by-step detail, what to do, where to go, what questions to ask, and how to get them answered. We’re going to assume that money is an issue for you. In other words, we’ll assume that you don’t have a rich parent or friend who is going to give you a free ride through college. We’ll also assume that you personally have limited means — in other words, you’re not independently wealthy. In that case, how are you going to pay for a college education? The first thing to determine is how much the school you want to attend is going to cost — to you personally. There are community colleges where the cost to be a full-time student for the whole year is only a few thousand dollars. Santa Barbara City College, for instance, costs less than $1,500 a year to be a full-time student (excluding books and supplies). At the other end of the spectrum is Sarah Lawrence College, where tuition exceeds $50,000, and total cost for the year is listed at just under $70,000. Check out our article College and University Cost Index to see just how much widely the cost of American higher education varies. But don’t let a big price tag stop you from considering a college or university. You need to understand that many schools charge less than full price. Just about every college offers some student financial aid. Think of the tuition and other costs listed on a school’s website as the full retail price of an item you want to purchase. Often, you can get the same item on sale. When it comes to colleges, whether you get a sale price (discounted price) on tuition and other costs typically depends on how much money you have and/or how much money people have that may claim you as a dependent (such as parents). Of course, it also depends on the generosity of the schools — how much money they have and are willing to distribute freely. Fortunately, for any accredited college you might want to attend, the government keeps track of these "sale priced" or discounted educational costs. NOTE: You’ll definitely want to attend an accredited college or university. Accreditation ensures that the degree you earn will open doors to a good job and to further education. The flip side is a degree from an unaccredited school, which is often regarded as fly-by-night and may do you no practical good in advancing your life. For more on accreditation, check out our article Accreditation of Colleges and Universities. In the box labeled "Name of School," punch in "Sarah Lawrence College" and hit enter or click "show results." In the right column, you’ll find Sarah Lawrence College listed along with its location in Bronxville, New York. The reason you are not taken directly to the information about Sarah Lawrence College is that sometimes there’s more than one college with the same name, so you get an intermediate step that lists any schools with the name you just punched in. So now click on the name "Sarah Lawrence College" (which is underlined). It will take you to the NCES information about this school. There are three information panels here that you’ll want to look at: the one labeled "tuition, fees, and estimated student expenses," another labeled "financial aid," and finally the one labeled "net price." Open these panels and start scanning down. The first panel ("tuition, fees, and estimated student expenses") gives you the full retail price of what your education at Sarah Lawrence College would cost you without any discount. The next panel ("financial aid") tells you how much aid the school gives to students generally. It gives you some idea of how generous the school is with its students, but it doesn’t really tell you what you personally can expect to receive by way of cost remission or to pay for attending that school. Finally, we get to the most important of the three panels, the one labeled "net price." That’s where you see what students end up paying out of pocket (their own pockets and/or that of their parents). Suppose, for instance, that the resources you can draw on amount to the medium annual income of an American family (around $50,000). In that case, for the most recent academic year listed (i.e., 2014–15), you would be paying just under $30,000 for everything. That’s still not cheap, but it’s a whole lot less than the $70,000 full retail price! One thing to be aware of here: The "net price" panel indicates the average net price. Some students with financial resources around the American median will get a better deal than this, others not. So you’ll want to check whether any other factors may help raise or lower the net price. Standardized test scores, high school GPA, and minority status may all play a role raising or lowering your expected net price. We can’t stress enough the importance of getting clear on just how much a school is likely to cost not some person in general but you in particular. Take Princeton University, a school about as expensive as Sarah Lawrence, if you had to pay full price. Princeton’s total undiscounted cost comes to about $65,000 for the academic year according to the National Center for Education Statistics. But suppose you come from a middle income family with about $50,000 a year total income. In that case, the average net price of attending Princeton comes to about $7,000. That’s way cheaper than attending most state colleges and universities. Of course, the challenge with a school like Princeton is getting in. As one of the top schools in the U.S., Princeton admits only about 7% of its applicants (a fact you can also find out on the NCES College Navigator website by clicking on the "admissions" panel for Princeton and then looking at the row labeled "percent admitted"!). So, if you can get in, you will get a top-flight education at a bargain-basement cost. Schools like Princeton are extremely rich, with huge endowments that allow them to underwrite the education of students who don’t have a lot of means (check out our article The 100 Richest Universities — Princeton ranks #5 on this list with an endowment exceeding $20 billion). But suppose you’re not the type of student with the ACT scores, the GPA, and the extracurriculars that will give you a good chance of getting into a school like Princeton. No worries, there are lots of schools that offer significantly reduced education costs, and in some cases no education costs at all. We even have an article here at TheBestSchools.org about such schools: The Best Colleges Providing Free Tuition. Full-time students receive a free college tuition. Ninety percent of applicants are required to show financial need to be accepted. Students are required to work 15 hours a week at an on-campus work station, as well as two 40-hour work weeks during breaks. The school provides a summer work program to cover the cost of room and board. With a school like the College of the Ozarks, you are set financially. A school like this doesn’t just make education affordable. It covers all your costs so you have no need for special gifts from rich relatives, no need for financial assistance from overtaxed parents, no need for finding and securing external scholarships, and, best of all, no need for taking out a student loan. Free-tuition schools thus offer huge benefits. Unfortunately, free-tuition colleges are few and far between. At the end of the day, most students are going to face some out of pocket costs: after the school you’ve applied to and been accepted at gives you all the financial aid it can, after your kindly relatives and struggling parents have supplied you with all the "extra" they can, you’re still going to need to come up with something. Work your way through school. Working your way through school is great if you can pull it off. Unfortunately, it usually demands you have a job that pays considerably more than minimum wage or else that you have some additional support that effectively raises you standard of living above minimum wage (such as living in mom and dad’s basement and eating at their table for free). If you’re at minimum wage and want to work your way through school, you face a catch 22: you need education to earn more money, but you need to earn more money to get educated. Hard Question: Will working as a student significantly cut into my time for study and thereby greatly extend how long I need to be a student? Time is money. If you’re working, you’re not studying (there are exceptions, such as night watchmen, who may be able to read and work at a desk at least some of the time they’re on duty). You need to be clear about your work habits and whether you’re going to be able to balance the demands between school and work. An important distinction to bear in mind here is the difference between full-time and part-time study. If you’re a full-time student, the bulk of your time and your best energies will be dedicated to school work. That will get you through your degree program the quickest. But it also means you have less time for work, and thus to earn the money to pay your way through school. On the other hand, being a part-time student allows you to set your own pace, but it slows the educational process down considerably. If you’re going to a campus-based school, it means that you won’t feel fully part of the campus life and of the incoming class with which you started (with a two-year program, for instance, many of them will be graduating in two years whereas you may not be graduating till long after). Hard Question: Will working and being a student significantly cut into my time with family, disrupting our family dynamics? One hears stories in which graduate students in particular departments have divorce rates north of 80%. Becoming a student invites many stresses and temptations that can severely affect the health of a family. If you have a family, you need to be very clear what you are getting yourself and your family into. Working, Saving, and then Going to School: We usually think of working and going to school as things that happen simultaneously. But it’s also possible to work in advance of going to school. In other words, you work, save the money from your work, and then pay for your education with the money you saved. A few generations back, that was possible. In the 1950s and 60s, it was common for young people to work at summer jobs and accumulate enough cash to pay for the majority of college costs during the regular school year. Schools like Harvard back in the mid 1930s charged $400 tuition for the year, and schools like Calvin College as recently as the late 1950s charged under $100 tuition per semester. These days, as College Navigator reveals, Harvard charges $47,000 tuition for the year, and Calvin College charges $18,000 tuition per semester (both costs for 2016-17). Harvard thus charges about 120 times today what it did in the 1930s and Calvin College thus charges about 180 times what it did in the 1950s. As we make clear in our article on the College Cost Index, inflation in higher education grows much much faster than for the economy as a whole, which is measured by the Consumer Price Index, or CPI. According to the CPI, $400 in 1935 dollars is about $7,100 in 2017 dollars and $100 in 1958 dollars in about $850 in 2017 dollars. Wages tend to rise with the CPI, not the HEPI ("Higher Education Price Index"). It’s the huge rate with which the "Higher Education Price Index" rises that prevents most people nowadays from saving first and then paying off their education, as they once did. Hard Question: Is my employment and/or course of study sufficiently flexible so that I can do both without significant conflict. Imagine a job in which you are on call all the time and are frequently summoned to handle emergencies. If your class schedule is inflexible, you may miss a lot of class time. In such a case, you may want to think about an online education as opposed to a traditional campus-based education (see our Savvy Student’s Guide to Online Colleges and Online Education). In any case, you need to make sure that you build in enough flexibility at work and at school so that you can do both. This may mean getting a special exemption from your employer (some employers may even help sponsor your continuing education; others may not be thrilled to see your attention divided — know which type of employer you are working with). At the same time, it means making sure you can take the classes you need when you need them. If you’re working your way through school, if you don’t have a high-paying job, if you don’t have any serious scholarship money, and if you don’t want to take out student loans, then you’re going to need to keep the costs down. As noted, one way to do that is by being a part-time student. Another way is to choose an inexpensive school. online colleges with low tuition. Note that the third option described here need not be mutually exclusive of the first two (you could attend a community college or state university via their online program). Still, it helps to think of these as separate, with the first two options delivering education mainly through real classes, the third through virtual classes. It’s safe to say that community colleges are always relatively inexpensive. Supported by the community and intended for students in the community, community colleges can’t raise costs too much without provoking the anger of the community. The downside of community colleges is that you usually can only study there for two years, perhaps getting associates degree, after which you need to go elsewhere if you want a 4-year degree. Also, the range of course offerings at community colleges can be limited. Still, as a way to control costs, especially if you are just leaving high school, a community college may be the way to go. These are usually commuter campuses, so you can usually get by with cheaper living and transportation costs than at a traditional campus away from home. In fact, many high school graduates are doing just that: going to the local community college for two years, and then transferring to the larger public universities in the state. As a consequence, community colleges are admitting more competitive students and in turn offering more advanced degrees by partnering with these larger public universities in the state, yet all the while charging their usual cut-rate prices! So just because you see the name "community college," don’t assume that all they have to offer is a 2-year degree. They may well be able to offer you a 4-year degree and even a graduate degree. McLennan’s University Center makes it easy to transition from your basic courses at MCC into affordable bachelor’s degree programs offered in Waco by distinguished partner universities, including Texas Tech University [Editor’s Note: This is a Big 12 School!] and Tarleton State University. The University Center allows you to remain in your job, live affordably, and still complete your degree goals here in Waco! Courses are rigorous, taught by many of the same professors who teach at the home campus or at other top universities. Classes are small and offered daytime, evening, or online to fit your busy lifestyle. Full-time advisors assist you with a smooth transfer of college credits from McLennan to the partner university. Upon completion, you will earn a fully accredited degree that is no different from the degree you would earn at the university’s home campus. A bachelor’s or graduate degree enhances your career options, and earning that degree debt-free gives you a lifelong financial edge! By starting at McLennan and earning your degree from a partner university through the University Center, the average cost of tuition and fees for a fully accredited degree is under $25K, before generous scholarships or grants. This passage is remarkable in many ways. It covers all the right bases regarding affordability and obtaining value. MCC is here bending over backwards to address all points of concern by prospective students with limited financial means. Moreover, by piggybacking on bigger and more prestigious schools, such as Texas Tech, exploiting economies of scale and fixed costs on their end, they can offer the same education as top Texas schools, with even the name of those top schools on the diploma, for a fraction of the cost. $25,000 for a 4-year degree is super cheap by any standard. If you need to keep costs down, check out your local community colleges. Because they can partner with other schools and now invariably offer courses online, you can increasingly study what you want, when you want, at the price you want. Your local community college may be the unrecognized jewel that makes the education you desire affordable. The first vertical bar represents the option we were just discussing, namely, community colleges. The second bar represents state 4-year colleges and universities with in-state tuition. 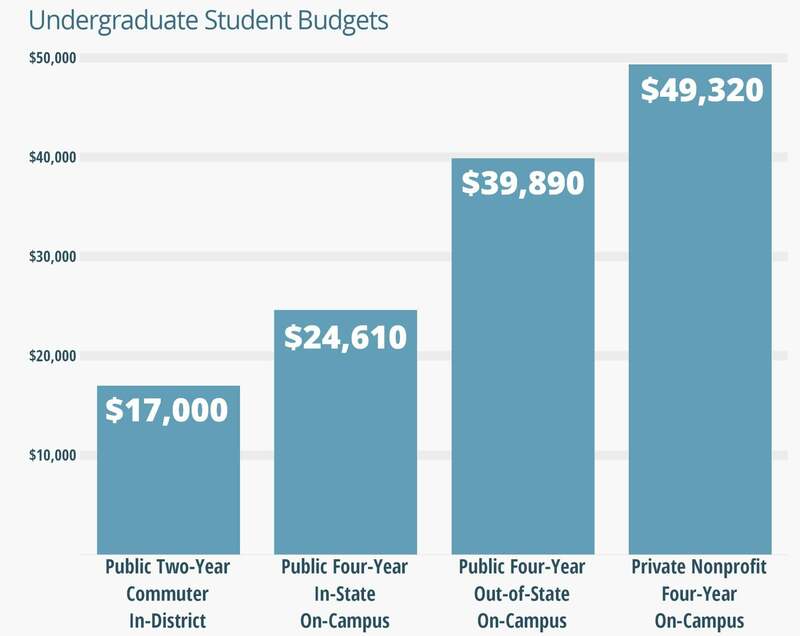 The taller the bar, the greater the total higher education cost. Clearly, the community college and the state college/university charging in-state tuition are the way to keep costs down. Note that the dollar amounts here are total costs for the year. Living expenses average to about $9,000 a year, books and supplies to about $1,300, transportation about another $1,200, and incidental expenses about another $2,000. These amounts are fairly constant across the board and add up to $13,500, so subtracting this amount from the above totals gives you a good idea of what you’re paying, on average, for tuition. In consequence, your annual tuition cost at a community college will be around $3,500 and at a public four-year college with in-state tuition it will be around $10,000. Still, even with public in-state tuitions, you’ll want to shop around and make sure you are getting good value. Consider the University of Virginia’s main campus in Charlottesville. For state residents, undiscounted tuition and fees for that campus in 2016 came to $16,500 (which is well above the $10,000 average of the previous paragraph). But the University of Virginia’s campus in Wise, Virginia lists only $9,500 in undiscounted tuition and fees for 2016 (which is right at the average). In-state tuition costs at state colleges and universities can display quite a lot of variation, even at different branch campuses. So, if you’re a Virginia resident, should you attend the Charlottesville or the Wise campus? Keeping the cost of tuition and fees down is certainly something you should do, other things being equal. But other things are rarely equal. Being cost conscious means also being aware of what you are getting for what you are paying. In looking for an affordable education, you are also looking for an education that delivers the knowledge, skills, and springboard you need for a better job and wages. In other words, you are also looking for return on investment. When it comes to the public colleges and universities that deliver the best return on investment (such as enabling you to find a good, high-paying job upon graduation), the University of Virginia in Charlottesville ranks way up there. Indeed, it ranks #19 in our article The 50 Public Colleges with the Best Return on Investment. For a comprehensive overview of online colleges, including links to everything we’ve written at TBS about online higher education, check out our online colleges hub page: The Online Colleges Source. For our single most important article about online colleges, check out our The 50 Best Online Colleges & Universities 2019 article, updated regularly. Price information is included to help you find the schools in your price range. Also, scroll down for related rankings of online colleges, especially those by state. In addition, you’ll want to check out our Affordable Colleges One-Stop Source, especially the article cited there, and directly accessible with the link here, titled 25 Online Colleges with the Best Return on Investment. As noted earlier, attending a community or state college need may in fact coincide with attending an online college. Indeed, many community and state colleges offer programs of study leading to degrees entirely online. So in addition to the resources just listed, you’ll also want to check out the online offerings of the community and state schools in your area. If you’ve read this far, you’re probably thinking that keeping expenses to a minimum, getting what help you can from family and friends, and working on the side may still not be enough to pay for your education. And so the next logical step would be to take out a loan. Before you take that step, however, make sure that you’re not missing some scholarship opportunities for which you may be eligible and which may significantly reduce your educational costs. Scholarships are essentially free money given to students that fit certain profiles. Sometimes the money isn’t totally free, as with athletic scholarships, where you are expected to play a particular sport in school, or with academic scholarships, where you are expected to maintain a certain GPA or take part in certain honors courses. The interesting thing about scholarships is that there’s a scholarship for just about anything you can imagine. There are private scholarships that people endow in memory of a deceased loved one who had some particular talent, skill, or interest. Take Northwest Iowa Community College, for instance. On their Scholarship Guide page, you’ll find the Dennis Van Wyk Memorial Scholarship, in the amount of $1,000, "established in memory of Dennis Van Wyk by his wife, Gert, and their children. Denny was a long-time member of the Truck & Diesel Technology Program at NWICC." Applicants for this scholarship "must have completed the Automotive Service program, be enrolled in the Truck & Diesel Technology program, and have demonstrated exemplary work habits, a positive attitude, and excellent attendance." Private foundations can also offer scholarships directly, instead of through a particular school. The American Sheep Industry Association, for instance, offers a Sheep Heritage Foundation Memorial Scholarship in the amount of $3,000 "made available for sheep-related graduate studies. The scholarship is for the advancement of the sheep industry, lamb and wool, through financial support of a graduate-level (MS or PhD) student who is attending a school in the U.S."
As you are researching the scholarships that may be available to you, keep your eyes open and don’t get distracted by first, and oftentimes false, impressions. Take, for instance, the Halas-Sayers Scholarship at the University of Iowa. George Halas was the owner of the Chicago Bears and Gale Sayers was the Bears star running back in the 1960s and 70s. You might think that this ought to be an athletic scholarship, but it is in fact a full-ride academic scholarship for minority students (given to students not in Chicago or Illinois, but in Iowa of all places!). If you are interested in attending certain schools, you definitely want to research the websites of these schools for the scholarships they offer (that’s how to find the Dennis Van Wyk Scholarship described above). Also, if you’re graduating from high school, you’ll want to see what scholarships are available for your high school’s graduates. Often times, local companies and individuals will endow scholarships for graduates of your high school who are on their way to college. A lot of these scholarships will not be huge, in the hundreds or few thousands of dollars (though some may be huge, like the Halas-Sayers scholarship described above). Usually they will not cover all your educational costs. But they can certainly help. And often there is nothing to prevent you from cobbling together several scholarships, which together may make a big difference in funding your college or university studies (if only to remove some of the stress of paying the cost of living). How do you find out what scholarships you may be eligible for? Always start with the schools you are currently attending or thinking of attending. Research their websites and talk to their guidance and recruitment counselors about what scholarships might apply to you. But you’ll want to go deeper. There are national, state, and local scholarships, there are school-specific scholarships, there are public and private scholarships, and many of them are hidden from immediate view. To help you in researching the scholarships that may be available to you, we have written the Savvy Student’s Guide to Researching Scholarship Opportunities. This article helps you not only in locating scholarships but also in successfully applying for them. Often you have to make a case for why you deserve a scholarship. This article shows you how to make such a case. The help of family and friends won’t be enough to pay for my college or university education. Trying to work while going to school won’t supply enough funds to pay for my education either. And scholarships, though great as far as they go, won’t go far enough to make a big dent in paying for my education either. If that’s where you’re at, welcome to the club — that’s where most people are at. It also means you’re probably at the point of wanting to take out a student loan. With over $1.4 trillion of student debt in the U.S., you’ll be doing what most students are doing. The average debt for students who graduated college in 2016 was $37,000. With about 2 million graduates from 4-year colleges in 2016, college students are racking up debt at unprecendented rates. Before you read any further, we therefore encourage you to carefully reconsider whether the conclusions above really hold for you. Is there really no way for you to avoid student debt and fulfill your desired degree program? If you can at all avoid, or at least minimize, student debt, we strongly advise you to do so. Okay, it seems you still want a loan. In that case, we would also ask that you read our short article The Risks of Student Loans: What to Know Before Going into Debt. And preferably we would ask you also to read our longer article on the same topic, namely, Benefits and Pitfalls of Student Loans. Have you now read these articles? Are you aware of the dangers of taking student loans? If so, please cross the following line at your own peril.